Patios and garden areas are the first things that people see of the property and maintaining them clean at all times is important. If your patio have become very dirty and needs professional sanitising use our services. Our cleaning technicians can restore the flawless appearance of your garden path and furniture, wood deckings, exterior walls and hard floor coverings. 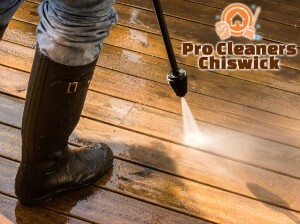 They provide highly effective pressure washing in domestic estates, located in W4 Chiswick which guarantee excellent patio cleaning. We work during all days of the week including on bank holidays without any change in the price of the service. Our cleaning technicians are properly trained, certified and skilled to implement effective removal of stubborn stains, splatters from paint, chemical residues and other grime. 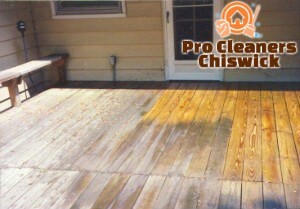 They use advanced jet washing machines which work under low pressure with hot water on stubborn stains and grime. The hot water eliminates the blemishes and dirt. Our staff can implement jet washing using cold water under higher pressure to eliminate algae, moss, weeds and soiling. Take advantage of our high-quality patio cleaning which is at your disposal in Chiswick seven days in the week. We don’t charge our customers more for pressure washing patios during weekends, bank holidays or evenings. Our cleaning technicians can check the condition and location of your patio, prepare you a quote and give you an estimate of the results which can be expected. They will need free access to water, electricity and drainage. Our patio cleaning services are carried out in line with the demands of each customer and can be used by the property owners living in W4 and nearby. Moss and algae on paved, natural stone and concreted floors make them slippery and dangerous. Use our services to maintain your patio and outdoor house areas well sanitised, safe and attractive.